That declaration is from Keith Kaplan, co-founder and CEO of the Tesla Foundation. Another way to look at it is "don’t be afraid." 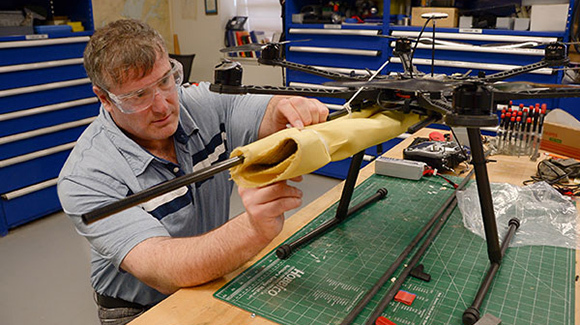 That’s why six California Community Colleges in Orange County are working together to develop curriculum that address what is called Autonomous Systems Engineering—technology tied to manufacturing or flying in the sky. The project is a workforce development program that's part of the California Community Colleges' $200-million Strong Workforce Program and will follow two pathways. “Some of the colleges will favor the aviation side—things and people that fly—and some will favor robotics and automation in manufacturing and theme parks,” said Lisa Knuppel, director of CTE/grant development at Orange Coast College. The timing for this program is right on, as the fast-moving drone industry takes root across the economy. According to Goldman Sachs, the fastest growth opportunities come from businesses and civil governments which the firm expects to spend $13 billion on drones between now and 2020, putting thousands of them in the sky. Long Beach's LA Video Drone, an aerial video production company, welcomes the news that California is preparing more people for work in this exciting industry. “Today’s students need to learn proficiency in airspace, equipment, weather conditions and current FAA Regulations allows for a remote pilot in command to assert good judgment when making important decisions involving risk and precautionary safety assessments,” said CEO Rodolfo Bianchi. For Professor Ed Valdez, who has been leading programs in aviation and travel careers at Cypress College for many years, this program doesn’t represent a start but rather deepens the commitment his school and others have to advancing the aviation sector. But this program is not just about aviation. Fullerton College—near the great theme parks of Orange County—and Irvine Valley College, with its emphasis on advanced manufacturing—particularly in the life science sector—are both part of the project. A leading Orange County legislator noted the importance of this project and boosting manufacturing regionally. “As most jobs in our state benefit directly or indirectly from manufacturing, it is critical that California’s students are trained in emerging engineering technology,” said Sharon Quirk-Silva, chair of the Assembly Committee on Jobs, Economic Development, and the Economy. "Ensuring that the manufacturing industry is equipped with a workforce to meet the needs of the 21st century economy will help ensure our communities remain vibrant and economically diverse for future generations to come." The California Economic Summit and its large, unique network for regional civic, business and elected leaders have long been focused on the improving the state’s workforce preparation programs. The Summit, which just announced its 2017 annual event will be held in San Diego on November 2-3, was one of the driving forces behind the additional $200 million the Legislature invested in career technical education. This type of program—with an eye toward making certain that the rapidly changing California economy has a workforce trained for industry needs—has the support of the Tesla Foundation, which is focused on the transition from the Information Age to the Autonomous Age. "We believe that education and workforce development must evolve quickly and with great urgency to meet the demands of the 'New Economy,'" said Kaplan. "Community Colleges need partners. We were pleased to support this effort to address the emergence of new disciplines and occupations in robotics and drones." The Tesla Foundation utilizes the combined efforts of its technology farm system, research, education, public-private partnerships, applications, and high-level educational events and summits.